Hamiltons Restaurant Wolverhampton has got it covered. It’s the time of year where you get together with friends, family and work colleagues, sit around a table and enjoy indulging into the festivities of Christmas Parties. 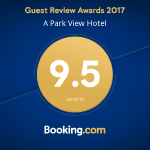 It’s also the time of year where you desperately try to find the right restaurant for the occasion, one that caters to everyone’s dietary requirements, preferences, and location. From the 26th November until the 22nd December we will be celebrating the festive season with our Christmas Parties! I am the Payroll Manager for Marston’s and I was wondering do you have a Christmas Lunch Menu yet? Hi, hopefully you would have seen our menu. 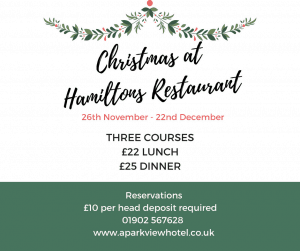 If you are yet to book have a look at our menu at http://www.aparkviewhotel.co.uk/christmas-in-wolverhampton/ or call us on 01902 567628 for our latest availability.